Hosting is what makes your web site visible on the internet. iComEx offers fast, reliable website hosting plans for every need - from a basic blog to a high-powered business site. Reliable web hosting from iComEx keeps your website up and running. iComEx features 99.9% uptime,24/7 security monitoring, DDoS protection and hands-on tech support! 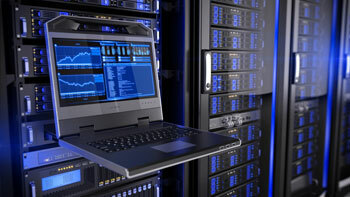 iComEx places its severs into data centers that meet the industry's most stringent standards. All of our selected facilities have successfully completed a SSAE 16 Type II audit, and meet enterprise-class specifications for power and cooling, redundancy, security, and hardened facilities. With network-layer managed services, a wide array of fiber transport providers, and an on-site, 24/7 support and network operations team, iComEx severs stand at the ready to keep your web site up and running. The iComEx data center's network provides our clients with superior performance for the most demanding online applications. The highly redundant network is configured for unmatched reliability, for critical business, and for IT operations. Using the latest generation core routing and switching infrastructure equipment, the network can deliver multi-homed connectivity to a mesh of the leading Tier-1 Internet backbones. This makes the network more robust than a single or dual Internet connection to your office, and more reliable than the two to three backbones offered by other hosting providers. All iComEx server hardware is fully managed by our data center's 24/7 support team and feature server grade Intel Xeon CPU's, hard drives configured with RAID 10 redundancy, Centos 7.x 64 bit Linux operation system, cPanel/WHM web hosting management suite, and 100 Mbps dedicated network up-links. This assures that the physical infrastructure is always up and running. All hosting configuration is handled by the in-house iComEx technical support team.